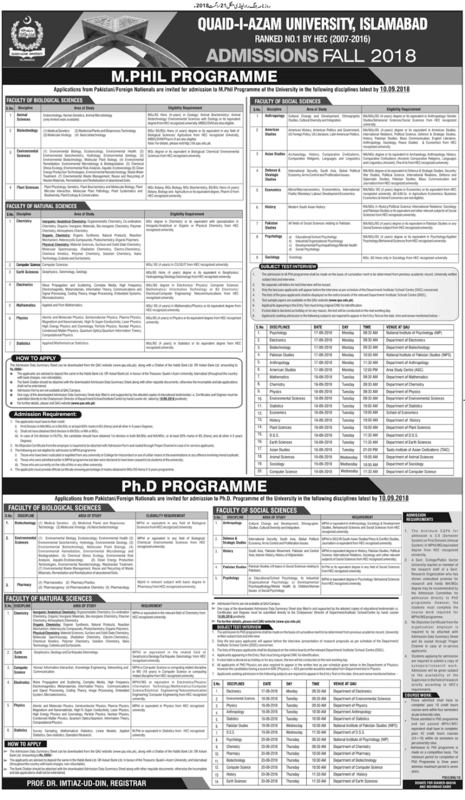 Quaid-e-Azam University Islamabad Admission 2018 for M. Phil and PHD programs. Applications are invited from all over the world for Quaid-e-Azam University Islamabad Admission 2018. Quaid-e-Azam University is one of the best universities in the Pakistan and the World. If you want to join Quaid-e-Azam University from anywhere in the world this a best opportunity for you. If you want to apply online visit Quaid-e-Azam University official website. All information related to Quaid-e-Azam University Islamabad Admission 2018 are given below in the advertisement.